This No-Bake Snickers Pie is easy enough to whip up on the busiest days, doesn’t require turning on the oven, and delicious enough that you’ll crave it all the time! Last week, Ally and Mariah, two of my best friends from school, came to San Diego for a few days (and we all went to Newport Beach, and Santa Barbara!) and since I had brought Mariah a dessert made of all of her favorite things, Ally requested a dessert that had all of her favorite things. I know Ally has a major thing for Snickers, cheesecake, chocolate, and caramel (um…who doesn’t?) so I decided I would play off on a combo of all of them. 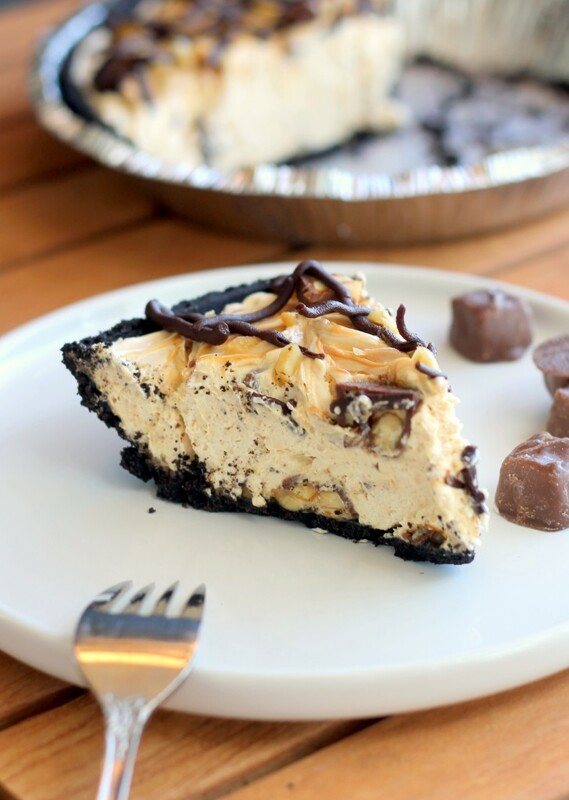 My mind ment straight to no-bake cheesecake, and my recipe for my Chocolate Peanut Butter Mousse Pie snuck into my head. Since Ally also loves Oreo crusts, I figured this would be absolutely perfect. And omg…it was. Let me get put it this way: when Ally tasted the pie, a legitimate tear of happiness slid down her cheek, followed by the words “oh my God!” said more times in a row than probably ever. This pie is tear inducing. You use dulce de leche FOUR times. Yeah. #sorrynotsorry. I never said it was healthy. To be honest, this pie is pure decadence. It is RICH and you can only handle a sliver at a time. But it’s sooOoOoOoo good. 1. Okay, so I sort of cheated here. 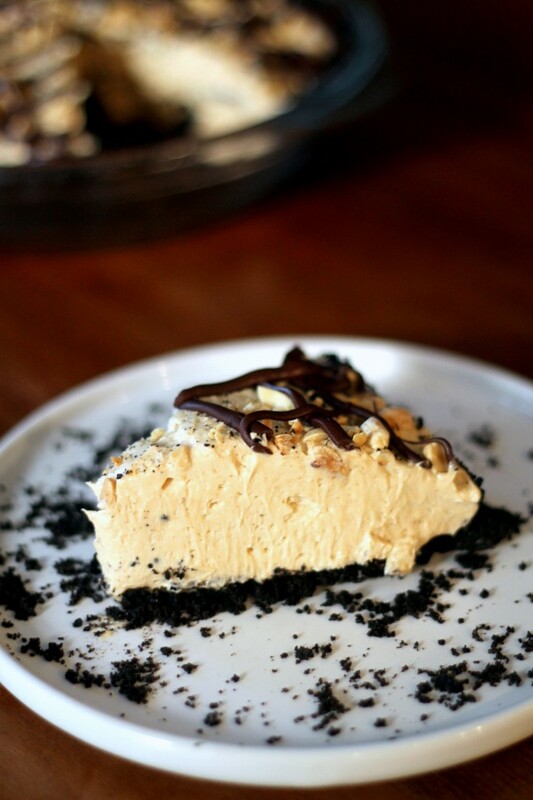 I used a storebought Oreo pie crust so that the pie could be done as soon as possible, also making this no-bake! Of course, feel free to make your own Oreo crust (you can use the recipe from the choc pb pie). I was just lazy. But it totally worked and was delicious, so whatever. 2. Here we have appearance #1 of dulce de leche. It’s spread thin on the crust, for a thin caramelly layer in every. single. bite. Some Snickers and peanuts get sprinkled on top of the dulce de leche too. 3. THE FILLING. This stuff is bomb. It’s cream cheese, Cool Whip, dulce de leche, and powdered sugar. And Snickers. Haters gonna hate about this having Cool Whip in it: if you’re a hater, you can try using an equal amount of homemade whipped cream, but I love the way the Cool Whip stays thick and creamy in this recipe and I just want to keep that awesome texture. You do you, though. I’m sure fresh whipped cream would be good too. Oh, this also gets dulce de leche swirled into it. 4. The Topping: this is a semi-sweet chocolate drizzle, with a dulce de leche swirl, chopped peanuts, and chopped Snickers. I had to make sure all the decadent things in the pie were represented in full on the top. And there you have it folks, the directions to heaven. Also, if you were wondering why half the pie is gone in the pictures…that’s the damage that gets done when you have three girls home alone with this pie. I’ve already thought of 101 variations to this recipe, so I reallllllly hope you all like it so I can keep making versions of it. Make it. ASAP. I want to hear your thoughts and reviews in the comments!! Spread 2 tablespoons of dulce de leche on the bottom of the pie prepared pie crust (fully cooled if homemade). Sprinkle half of the chopped peanuts and 1 of the chopped Snickers bars over the bottom of the cooled pie crust. In a large bowl, beat 1/4 cup of the dulce de leche with the cream cheese until smooth. Add powdered sugar and beat until smooth. Add in the thawed Cool Whip and beat mixture until creamy and fluffy, scraping the sides as needed to ensure everything is fully incorporated. Fold in 1 chopped Snickers bar. Pour filling into crust, evening out the top with a knife or spatula. Dollop the remaining 2 tablespoons of dulce de leche around the top of the pie and swirl in with a knife. Top with remaining peanuts and chopped Snickers. If desired, drizzle the top of your pie with melted chocolate. Refrigerate for at least an hour before serving. Enjoy! Like this recipe? Check out some of my similar favorites! I NEED a big slice of this. It looks incredible!!! Cannot wait to try this Rachel! So easy and so delicious!Can’t wait to see more versions! Why do I not have any dulce de leche at home when I need it! WAHHHH I have to make this! Doesn’t that always happen?! You could use a caramel sauce in the dulce de leches place if you wanted to – just use a thicker caramel sauce, not a thin runny one! 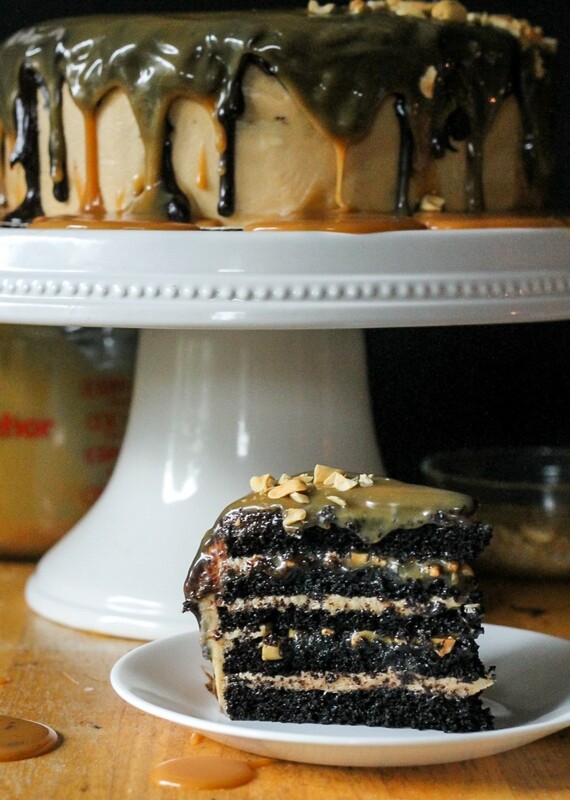 that cake looks delicious, just wondering what is dulce de leche?? I have never heard of it, im in Ireland, do u know where I could purchase it over here? Hi Catriona, Dulce de leche is a kind of caramel-like treat. It’s a latin american ingredient, so I can see why it wouldn’t be available in Ireland! In place of it, you can use a thick caramel sauce or make your own. If you Google how to make dulce de leche, you’ll find a ton of recipes! Most use a can of sweetened condensed milk that you just simmer in water for a few hours. Hope this helps! thanks for the reply Rachel…I never thought of the condensed milk, I use that to make banoffi pie filling, so that would do nicely, cheers! It looks amazing Rachel! I love these kinds of pies! And the dulce de leche – yes!! So yum! Oh goodness gracious! This looks incredible! And so sinful – I love it! Holy decadence, girl! I would give my right arm for a slice of this right now! I love rich things that you only need a little bit of, it’s makes you want and eat more than you should. *drool* !!! Great job, this looks sooooo good! This looks like one of the best pies ever!! YUM! What an incredible looking pie! 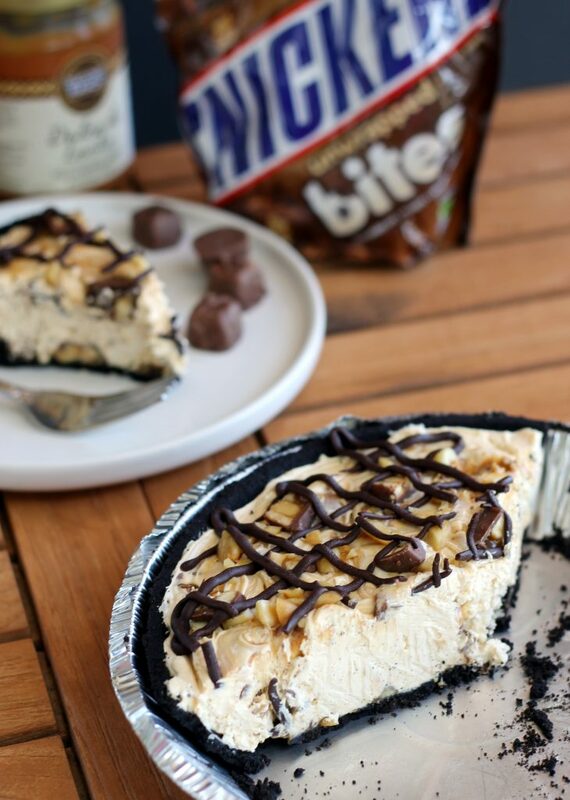 My hubby loves Snickers so this is a must-make for us. Also diggin the no-bake :) Pinned! Who’s hating on Cool Whip!? That stuff is the bomb. Making a pie with it tonight, actually. 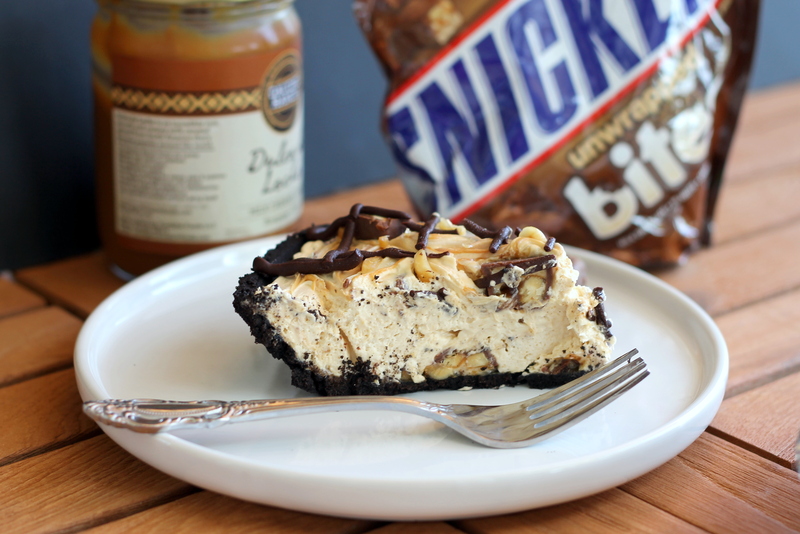 :) Honestly, I’m not that big of a Snicker’s fan, and I feel like I need this pie in my mouth immediately. It looks beyond fantastic! Thanks!! Honestly, I’m not the biggest Snickers fan either, I just used it because it was Ally’s favorite! You can definitely replace the Snicker’s with whatever chocolate bar your heart desires. I can totally be your BFF if you make me these every time we see each other! I love snickers and dulce de leche is one of my weaknesses! Delish!! I’m talking about this pie is out of control. OUTTA CONTROL!!! I love it. And I’m pretty sure I also need it. This looks insanely delicious! I could live on Snickers (it has nuts – -that makes it like an energy bar, right???). 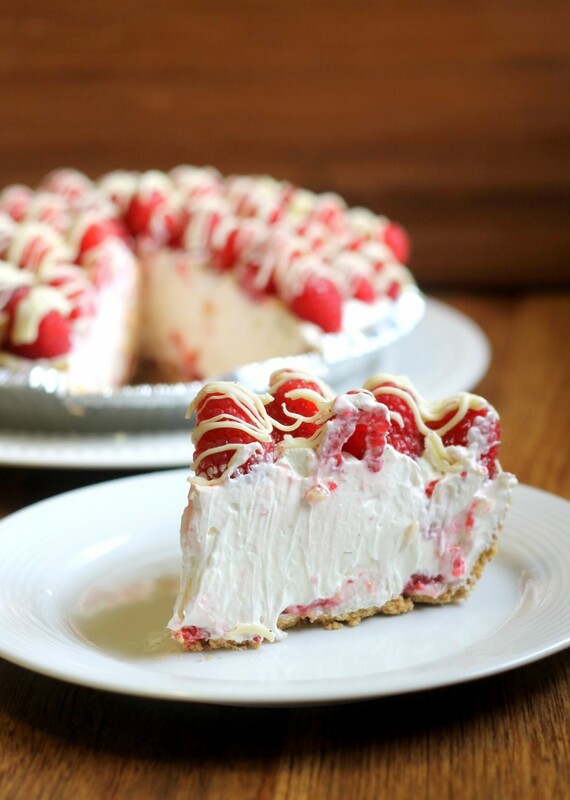 And no-bake cheesecake is such a great dessert, especially when it’s still way too hot to turn on the oven. I’m definitely bookmarking this for later. I hate to sound like everyone else, BUT this looks INSANE! My daughter (6yearsold) made this today and everyone was raving about it. So delicious! Okay, so my wife sent me a link to this recipe- and I promptly asked her to meet me at the grocery store. Failing to find a premade oreo crust, I remembered a simple one- 24 oreos without cream (48 wafers) and 1/4 cup butter (crush the wafers until they’re about the consistency of panko crumbs) and put it in a pie tin. Refrigerate for an hour before you make the rest of the pie. SO- we make this decadent MONSTROSITY and take pictures- and text ’em to a few friends. Within the hour my apartment is full of people lining up to try this thing. I dole it out a sliver at a time (a tenth of the pie max at once) and it’s almost gone. People hate me for this, people love me for this, I am a god, my wife married satan incarnate, and so on. LOVED this comment. You know it’s funny when it made me laugh while I was still in bed, pre-coffee :) So glad that everyone liked it. This recipe is a definitely favorite of my friends and family as well! Thanks for stopping by, and trying the recipe! You most definitely could! If you wanted to make it totally chocolatey, simply replace the dulce de leche with chocolate spread. You could also do a combo of the two (yum! ), just try to keep the ingredient proportions similar. Because it’s a no-bake recipe, you can taste as you go and adjust to your likings. Happy baking! So glad you like them Terrie! :) Hope you love this pie! Wow Rachel! 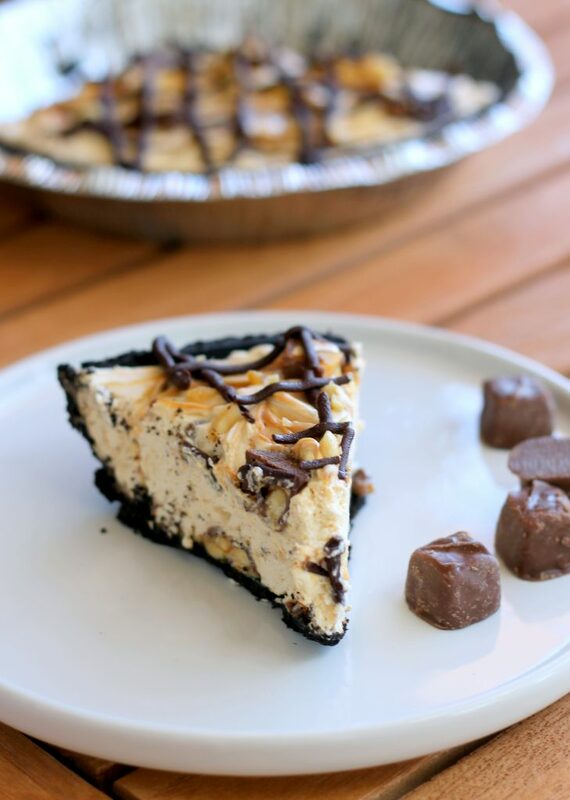 Snickers is my favorite candy and it is good to know that I can make it in pie form with no baking required. This pie was really good! I am wondering if you have tried to use heavy whipping cream instead of cool whip? And if you have ever tried to make the filling some sort of chocolate? I never have, but I imagine it would hold up fairly well. Just be sure to keep it refrigerated and don’t over mix the batter! To make the filling chocolate flavored, replace the dulce de leche with melted semi-sweet chocolate or a hot fudge sauce! the cheese cake didn’t set though.. just wondering if a little gelatin should help ? Hi S, how odd! It should set in the fridge without the need for gelatin, but if you’re having issues, a tiny bit of gelatin could help thicken it up a bit. Enjoy! so this feedback is kinda late.. i tried with a bit of gelatin too.. it would just kinda melt after a while… is too much whipping a problem, cause i sure am whipping it up real good for air bubbles to form. 1. i’m not using dulce de leche… i’m just cooking condensed milk, till its thick enough. This pie looks awesome! Can I freeze it? Then let it sit to thaw a bit before serving? Yes you should be able to freeze it with no problems, I’d let it thaw for a few hours in the fridge before serving. Could you use Mars bars instead of Snickers? I presume so but what do you think? Obviously but allergy sufferers can’t eat the snickers version! But what do you think about non-nut options? What I love about this recipe is that the pie filling isn’t made out of peanut butter. True snickers fans would know the middle of a snickers is nougat and carmel, not peanut. Most other recipes I’ve seen so far all use peanut butter. Can’t wait to try this! Thank you! !